CANTON, Mass. (September 29, 2011) –Wishing your flavor won the Baskin-Robbins flavor creation contest last year? Don’t despair, Baskin-Robbins today announced its 2nd Annual Online Flavor Creation Contest providing guests with the opportunity to tap into their inner chef to create a winning new flavor. From October 1through October 31, ice cream fans can enter the contest online by creating a virtual flavor at www.baskinrobbins.com/flavorcreator. Visitors to the site can choose from 31 base flavors, a variety of ribbons such as fudge or peanut butter and a myriad of different mix-ins ranging from candy pieces to cookies. To kick this year’s contest up a notch, Baskin-Robbins has added even more flavor bases, ribbons, and inclusions. New ingredients include: Strawberry Yogurt, Mango Yogurt, and French Toast Ice Cream flavors, Oreo, Cherry, and Whipped Cream flavor ribbons, and Blondie Brownie, Golden Oreo, and chocolate covered cookie inclusions. Once the contest closes on October 31, Baskin-Robbins executive culinary team will narrow down the submissions to determine the top 20 finalists who will receive free ice cream for a year. Ice cream fans will then vote online for their favorite flavor to determine the winner. The winner will receive a trip for two to Boston which includes a three-night stay at a landmark Boston hotel, a night at the theatre, $1,000 in spending money and a trip to Baskin-Robbins headquarters where the winner will meet the Baskin-Robbins culinary team and spend a day bringing their virtual flavor to life. The winning flavor of the inaugural 2010 contest was Toffee Pecan Crunch, created by Diane Sroga of Chicago. Her winning flavor featured a combination of extra-rich, creamy chocolate ice cream with a sweet caramel ribbon and crunchy bites of HEATH™ bar and pecans. 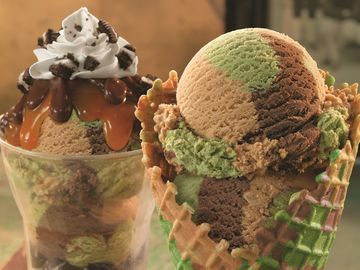 Toffee Pecan Crunch was the June 2011 Flavor of the Month and joined the ranks of the Baskin-Robbins world famous flavor library which contains more than 1,000 flavors such as Gold Medal Ribbon, Jamoca Almond Fudge and World Class Chocolate. The contest is open to US residents of all ages. The top ten finalists will be chosen by Baskin-Robbins for display on www.BaskinRobbins.com. Participants and consumers will then have the opportunity to vote for their favorite flavor. For more information and official rules, please visit www.baskinrobbins.com/flavorcreator.